Concept: This early to mid-successional mixedwood Vegetation Type (VT) has an overstory co-dominated by balsam fir and red maple, with a variety of other associates. MW4 is a broadly defined VT that follows stand-replacing disturbance events such as windthrow or harvesting. Residual trees (survivors of past disturbance events) should not be used for classifying this VT from others. Due to the short-lived nature of balsam fir, this VT often has significant levels of coarse wood debris and/or numerous snags. Balsam fir – Red maple / Wood sorrel – Goldthread is a commonly found VT in eastern Nova Scotia. Vegetation: Balsam fir and red maple are the dominant overstory trees, with lesser red spruce, yellow birch, white birch, white spruce and/or aspen. Minor levels of black spruce can also be found on some sites. The shrub layer is moderately developed and includes mainly regenerating trees (especially balsam fir and red maple). The herb layer is represented by common forest flora (e.g. wild lily-of-the-valley, starflower, bluebead lily, goldthread and wood sorrel). Bracken, hay-scented fern and cinnamon fern can also be found – their presence and relative abundance reflecting available moisture. Bryophyte development varies, with coverage directly related to relative softwood abundance in the overstory. Schreber's moss, stair-step moss and broom moss are the main species. Bazzania can also be common where coarse woody debris has accumulated on the forest floor. Environmental Setting: MW4 is mainly associated with fresh to moist, nutrient medium soils of variable texture. This VT is common throughout eastern Nova Scotia and is scattered elsewhere. 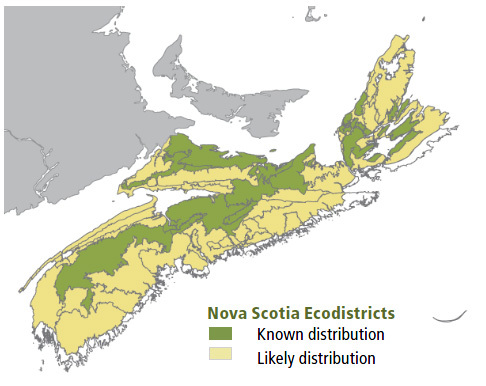 It is common throughout the Maritime provinces, but less frequent across higher elevation of northern New Brunswick. Successional Dynamics: MW4 is an early to mid-successional VT dominated by balsam fir and red maple. It is an even-aged forest that usually follows stand-level disturbances such as windthrow and harvesting. MW4 can sometimes renew itself through natural stand deterioration (facilitated by minor insect predation, disease and natural senescence) followed by development of advanced regeneration. Over time, and with possible increases in red spruce presence, MW4 could succeed to other VTs including: SH5 (Red spruce – Balsam fir / Schreber's moss), SH6 (Red spruce – Balsam fir / Stair-step moss – Sphagnum), SH3 (Red spruce – Hemlock / Wild lily-of-the-valley) or MW1 (Red spruce – Yellow birch / Evergreen wood fern). Residuals in the overstory can provide evidence of pre-disturbance conditions and should be considered when assessing possible successional trends. 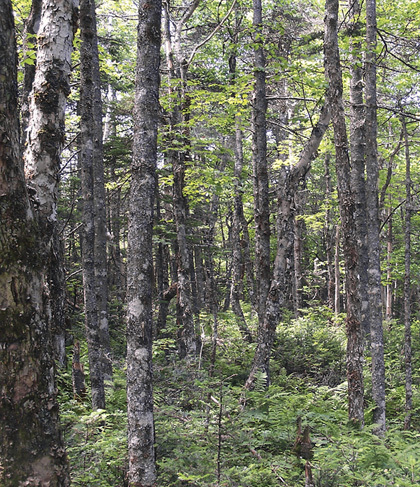 Ecological Features: This closed canopy forest typically occurs as large patches following stand-level disturbances such as fire or harvesting. Regeneration is by seed and coppice. This ecosystem provides several ecological functions including the facilitation of nutrient cycling, rapid site revegetation after disturbance, and the establishment of nurse crops for later successional species such as red spruce, hemlock and yellow birch. Residual trees from early successional stages are common and may provide notable wildlife habitat values and increased forest structural complexity. Mixedwood forests can also provide both shelter and food for overwintering deer. Sapling stage forests are an ideal habitat for snowshoe hare, and are a favoured browsing habitat for moose and deer. Red maple provides one of the most important early and abundant sources of pollen and nectar for a wide range of insects. Distinguishing Features: This mixedwood forest of balsam fir and red maple establishes after a stand-level disturbance. 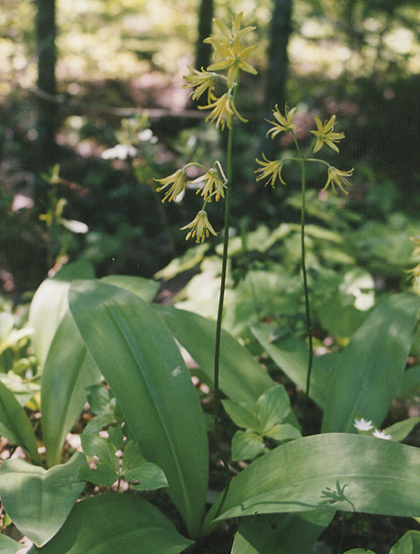 The herbaceous layer is generally comprised of common woodland plants such as wild lily-of-the-valley, starflower, bluebead lily, goldthread and wood sorrel.